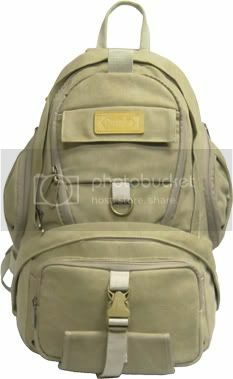 The Opteka C950 Khaki canvas backpack with leather trim is designed to carry 1-2 rangefinders or digital SLR cameras with an attached lens, 2-3 additional lenses, 1-2 flashes and accessories in the lower section. The upper section can hold even more equipment, food and cloths. The backpack is constructed from dual laminate waterproof canvas with a high-density, closed-cell dura-foam interior with two dividers. The main camera compartment can be accessed from the lower zipper on the front of the backpack or from the interior zipper in the upper section. The backpack has three exterior front pockets, a bottom pocket and two side pockets. There is also a tripod holder on the front. It is carried by an advanced harness system which is designed to allow full adjustment of its padded ergonomic shoulder and waist straps. A rain cover is also included that is made to fully cover the C950. Holds 1-2 DSLR bodies with lens attached, 2-3 additional lenses, a flash, other accessories, food, clothes and other personal items. Exterior: L 12" x W 10.5" x H 19.5", Interior Upper: L 11" x W 7" x H 11.5", Interior Lower: L 11" x W 8" x H 6"